It can be easy to get discouraged when dealing with personal challenges. We tend to make all kinds of excuses for not going to the barn, rushing through chores, abdicating horse care to another or depriving ourselves of other moments to enjoy our horse. Our daily grind can get in the way of what fuels our soul. What would you do with your horse passion if you found yourself suddenly paralyzed? Diane Kastama decided to add wheels so she could continue. She competes world-wide at FEI events with combined driving (modeled after 3-day eventing). As a former dressage rider, she tried going back to riding first, but kept falling off. Now, she’s internationally recognized for her skills at a sport where she’s competing against able bodied riders. She’s won world championship medals, including individual silver and team bronze as well as a gold medal and more. Can you imagine being so determined and resilient to start a new discipline you’d never tried while confined to a wheel chair? She drove her first horse in 1995 – after a paralyzing car accident. Then, began combined driving competition in 1999. By 2002 she was on the world stage competing at top levels. Susan Ashbrook with Equine VIP did a recent interview with this remarkable woman. This video (just under 9 minutes) is so worth the watch. If you’re thinking your challenges are tough, imagine dealing with hers and maintaining such a positive attitude, then achieving world-wide competitor status. 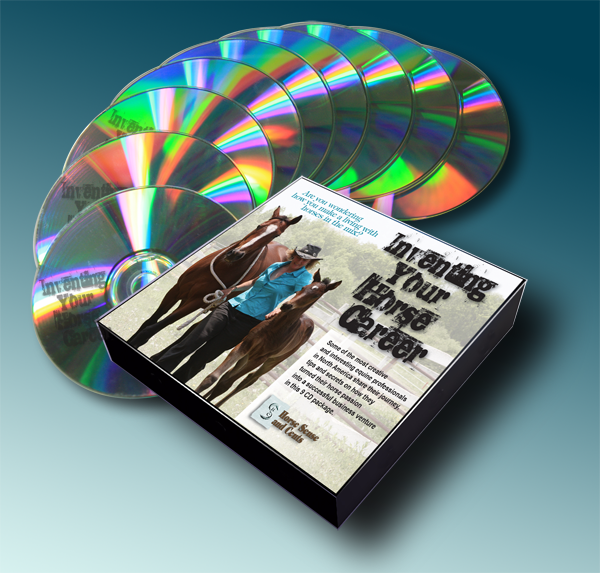 Oh, and if you’re looking for some creative ideas on how you can design a job that keeps horses in the mix, we have a lot of free material in addition to some products you may like in our Inventing Your Horse Career section of this website. 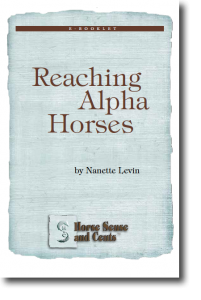 Are you listening to what your alpha horse is trying to tell you? Even with alpha fillies and mares, there’s usually a good reason for an animated objection to a request. It’s rarely because they’re being belligerent. Before you jump to correct a horse for bad behavior, consider what your alpha horse is trying to tell you. If it’s a fair response, let it go and move on. Effective young horse training, assuming your goal is to develop a horse that trusts you and enjoys schooling sessions, requires you to keep the horse in the conversation. This weekend, I was working with a couple of alpha gals. This young Arab mare was resisting the right rein a bit dramatically. This isn’t behavior I’ve seen from her before. She’s willful and opinionated, but has always been comfortable with a bit in her mouth and responsive to light hand cues. Anything else I asked of her was met with an impressive attempt to understand and deliver. There are times when it’s necessary to say no in a clear and commanding fashion. This wasn’t one of them. There were good clues to suggest her reaction wasn’t combative. She responded willingly to all other aids. Working the left rein wasn’t an issue. Her attitude was kind, forward and eager until I put pressure on the right rein. She seemed relieved and appreciative when I went to strong leg cues for turns and left her mouth alone (ordinarily this mare would clearly communicate her annoyance to too much leg pressure). She was totally focused on me throughout the time we spent together. The owner is going to have her teeth checked to either confirm my suspicion, or discount it. Regardless, something wasn’t right with this gal. When working with any equine, but particularly with young alpha horses, it’s important to be able to quickly distinguish between obstinate push back and a fair objection. Over the past couple of months, I’ve been working with a delightful 4 YO Irish Draught Sport Horse (IDSH) filly. She’s honest, expressive, smart and a super character that has this artful way of letting you know exactly what she’s thinking. Recently, she showed her usual pleasure during grooming time (this always includes some good scratches in her favorite places – she still doesn’t quite understand my objections to mutual grooming). Her ears pricked up and stride animated as we headed toward the training area. As usual, she advanced through what usually would have required a week’s worth of riding time – in her mind – during the week-long training lapse. During the week (while she wasn’t ridden) she had lengthened her stride a foot or more. Her frame was longer and lower and more relaxed. She’s always excited about the prospect of learning something new. We started canter last week(end). She seemed to intuitively know when the request came. She took a stride or two to figure it out, but then transitioned to a lovely canter on the correct lead. It’s a small area requiring some tight turns. She even made the turn, responding to the left-rein half-halt and right leg pressure with ease. That was more than she was ready for, but she was a good girl about it. No matter how long you’ve been working with horses, everyone does dumb things. I figured since she handled that so well – even commenting to the farm owner how surprised I was at this – to demand more. You never have to guess what this filly is thinking. I closed my leg on her (she’s not super fond of leg pressure) and encouraged her to continue around what amounted to about a 20-meter circle. She let me know emphatically I was asking for too much. She was right. She slammed on the breaks and reared. It was a fair complaint. So, instead of correcting what could have been construed as bad behavior, I simply let her finish expressing herself (it was brief) and gently asked her to take up a trot. We went back to some circles and figure eights at the walk and trot – something she was confident and comfortable with – then I asked for one last canter transition. She responded to the cue immediately, on the correct lead, willingly. 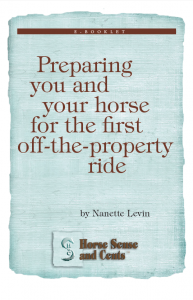 After five or six canter strides – before we hit the turn – I gave a light check on the rein. It was time to give a good girl pat and call it a day. Things could have gone very differently with this IDSH filly. If I had gotten after her for her expression, she would have rightfully escalated things. She’d remember the conflict. It probably would have taken weeks to overcome her resistance (she is a Warmblood, after all) and resentful attitude toward training. Horses seem to naturally appreciate and trust someone willing to include them in the conversation. 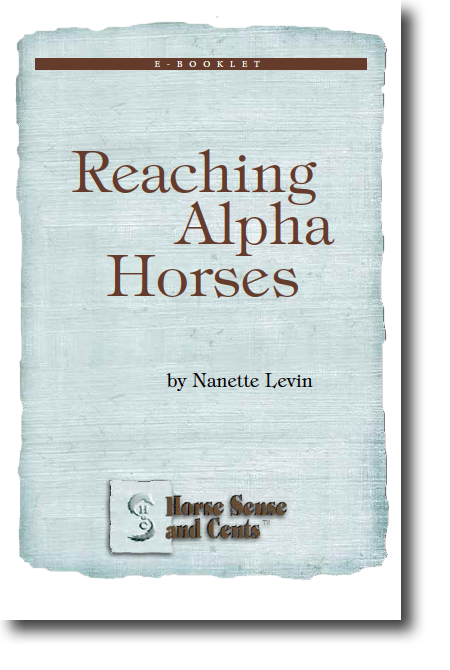 With most issues that occur with alpha horses, calm, patient insistence is a good approach. That wasn’t the right reaction here. Instead, riding out the tantrum with no reaction and asking for less was much more appropriate. With the Arab, if this is a pain issue, it’s wrong to chance she might associate training time she’s come relishes with an unfair rash correction. She was willing, eager and focused with all else. 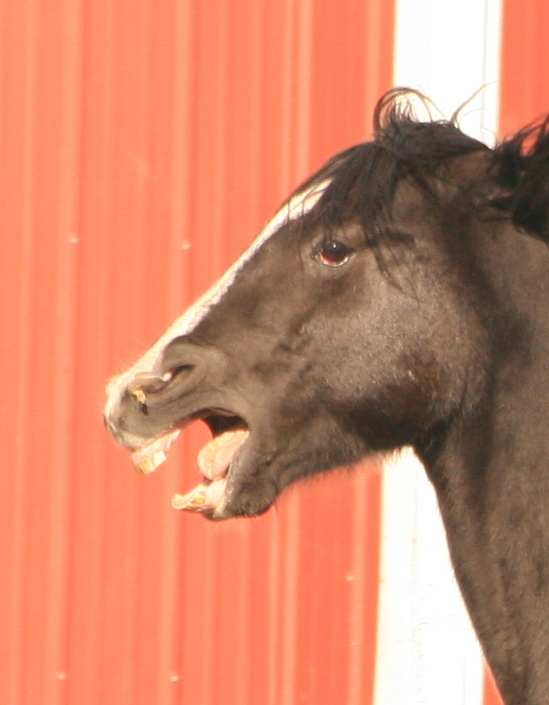 If your horse is acting out, consider asking why before you correct. You might discover interesting new ways to understand what they’re trying to tell you. Have you found yourself assuming an alpha horse (or any other) was testing you but then came to realize something was wrong? I sure have. It pains me to reflect on some of the mistakes I’ve made. Or maybe you had one of those wonderful moments when your understanding caused your horse to melt? It’s your turn to enlighten me in the comments below. Look left and share, while you’re at it. Thanks! Bred mean doesn’t mean you can’t reach them. After more than a couple of decades in the Thoroughbred racing arena, I do believe some horses are born mean (or crazy). With no breed registry incentives for most owners (many never see or handle their horses except from the grandstands or winner’s circle) to consider the softer side of breeding, generations of speed-only focus have created some interesting results. Things like temperament (this does breed through), conformation (ignorance is big a culprit here), bloodline maladies, bone, feet and other factors beyond black type in a pedigree get forgotten in the race to produce the next superstar. Sadly, few consider that that speed won’t produce win pictures and earnings checks if the stud produces nut cases that get banned, spindly-legged, bad-footed horses that break down or mean horses that are so singularly focused they’re unsuitable for a career. Mares that are mean, slow, crooked or heartless don’t help either (even if you got them for free). That said, it’s rare for me to encounter an inborn mean horse in other breeds. Handling can certainly make a horse mean, but few are wired that way. In the last year or so, I’ve had the opportunity to work with a Morgan cross that’s just that, but so amazing in what he’s decided to do with it. His father is vicious, according to what I uncovered after starting to work with this guy. You can tell his go-to place is violent. What’s so incredible about this gelding, though, is even with blood boiling, he wants to be a good boy. Give him an immediate acknowledgement for a try and his attitude transforms. 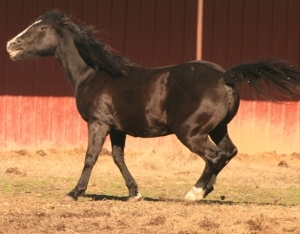 Of course, he’s one that needs boundaries and a swift response for those moments when his instincts overtake that alter-ego trying to come out on issues that have already been addressed and understood (which is curious – ordinarily this type of response with a mean horse will escalate things), but he’s decided he wants to learn, participate and be appreciated. You can almost see the warring factions duking it out in his brain as he tries to process what’s going on around him. Somehow, the praise seems to weaken the power of instinct with this confused fellow. If you dig deeper with your mean horse you may be able to reach him. Recently, he was introduced to driving. This kid’s not the brightest bulb in the barn, so can only handle very small doses of input and insistence. It’s typical for young horses to be this way (he’s five), but much more so with this critter who doesn’t have a whole lot working between the ears. Apparently, these driving lessons made him unridable. Over the phone it sounded like the young man performing the driving lessons had triggered his mean side by failing to praise and pushing too hard. On site, it became clear his trust was shattered. This gelding still wanted to connect and play with humans, but no longer had confidence in himself – and certainly not people after experiences that were too confusing for him to understand when he was doing what was being requested and when he wasn’t. It was incredible to see this boy, who is clearly constantly fighting a mean instinct, still wanting to be a good boy. We worked through it in about an hour. The owner was smart to recognize the issue and call for help. Severe bridling issues were resolved in about ten minutes (he has a favorite rub spot between his eyes that has a huge calming effect) to the point that the owner was able to bridle him with ease – then and every time after. Riding time was a joy after that as I joined the pair on foot through the trials. This was a horse that had previously settled best by moving to trot when concern was overwhelming, but now needed to stop, look and settle to resolve his angst. 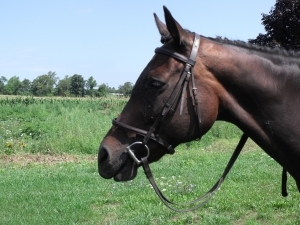 That was a thrill for his rider too, who was dreaming of quiet walk outings together through the woods. What we discovered is this guy needed more one-on-one riding time with his owner to bond and learn before he was ready to take on new people, new demands and new approaches. While this gal is a novice, she has great instincts in responding to what this horse needs and does – knowing when he’s testing and when he’s honestly concerned. She’s still learning on the quick praise front for tries, but can see how dramatically the horse responds to this, so recognizes the importance of being there soon. Once the pair get that deep connection under saddle (with rides being such a joy she’s now spending a lot of time trekking around to accomplish this), he’ll likely handle driving requests with ease – provided she’s there to encourage and supervise. What makes me so fond of this guy (he’s not the overt endearing type) is his decision to fight what drives him, preferring a more engaging and fulfilling partnership approach to life. I don’t ever recall seeing a horse work so hard to stifle instinct drivers for a different reality. Watching him puff up and alter his ego in response to recognition of the little tries is an incredible experience. Seeing him quickly come back to that place after an encounter that would make most mean horses more resolved in their conviction to hate humans was inspiring. You gotta love that kind of discernment – particularly when it comes from a horse with less brain cells to rub together than most. What a special guy he is. Have you encountered a horse that surprised you? Please share in the comments below. If you would, please also go to the left of this article and tweet, share, G+, Stumble or whatever else you’re into. Thanks! It’s been interesting to witness how Remi (my canine mutt) has (or hasn’t) handled a temporary move to the suburbs. While I’m not a proponent of applying dog training techniques to horses, I did find some curious reactions from her that reminded me of odd horse behavior I’ve witness. Remi’s spent her life (from 11 weeks on) at Halcyon Acres® (the farm). She ran free with Gatsby’s keen and careful supervision and guidance. He kept her safe, taught her the property lines, showed her how to hunt – FAIL , and tried to coach her on farm duties– another FAIL. Remi was born a pet. Gatsby must have come from some serious work dog bloodlines. Although Remi’s usually heartless, I was shocked at how she reacted to the move. Interestingly, when I trucked the two remaining Halcyon Acres® horses to new (different) digs, they provided some big surprises as well. I figured the old-steady, Dixie, a former impressive racehorse with a prior history of shipping to many different locations annually, would handle the move with ease. She walked on the trailer like the seasoned champ and kind accommodator she’d always been. All hell broke loose between when I dropped her off and returned an hour later. 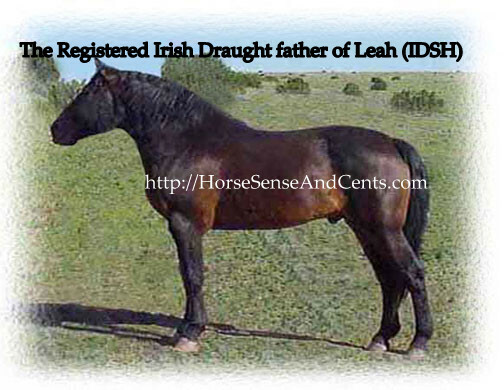 Leah, the 4 YO Irish Draught Sport Horse, who had never been off the farm, was my big concern. I thought loading might be tough (it wasn’t) as I had only been able to get her standing on the ramp in schooling time alone. She was uncomfortable being first on, so we simply switched it up so she could follow Dixie. After our first stop (Dixie’s new temporary home) we simply took both off and easily loaded Leah back on alone. Now that she had ridden in this contraption, she seemed to understand the request and realize it was easy. Special thanks to Faith Stiles for providing such a safe and comfortable ride. Faith and I had each scheduled about 3 hours for Leah (we laughed together as we realized how wrong we each were with our private thoughts on the anticipated ordeal). As it turned out, it took about five minutes to load and another ten for us to unload, turn her out, see she was fine and then add her two new pasture mates. Faith had smartly brought ‘the girls’ into the barn so Leah could explore and accept her turn-out digs first, then get acquainted with her roomies. No angst, no issues, no big deal. Leah’s old-soul mentality was a factor, but we were still both amazed at how easy it all went. As expected (this wasn’t a surprise), Leah adopted the new routine in less than 24 hours and was a helper once she knew the drill – and continues entertaining the caregivers with her cleverness. [caption id="attachment_3116" align="alignright" width="300"] Sweet, beautiful Dixie had a tough a time moving off the farm. Meanwhile, Dixie, in a panic about being indoors alone in a new locale, busted through the rope/chain strung across the barn door where she was confined. We spent almost two hours trying to separate her from a tight herd of six with a gelding lead horse intent on savaging her. Ultimately, she did settle in, but the first week or so was dicey. How dumb was I to assume this mare would easily transition to a location away from the only place she’d known as permanent? The things you think wouldn’t be a big deal seem to bother Remi the most (I’ve found this to be the case with horses too). She has no problem with monster trucks, indoor living (being a couch potato is her new favorite thing), vehicle traffic or leash courtesy. She’s terrified of cyclists, pedestrians and especially street hockey. Remi’s always been a very attentive dog. Still, I was surprised to discover how adept she was at recognizing subtle cues from a leash without any prior training. If she’s not on my heels (her choice at the farm), she’s gentle at my side or in front. Animals who put primary focus on you generally strive hard to do what they think you want. This (spayed) female dog now lifts a leg and then throws dirt on her spot with considerable zeal. Gatsby never felt a need to mark his turf (he knew he was top dog). Remi thinks everything is going to kill her so puffs up and sounds vicious with new sights and sounds. Gatsby assumed everything was safe until proved otherwise, rarely barked and felt no need to intimidate. He approached life with an amiable, fun-loving fascination. Of course having a jaw that could crush marrow bones and lightning-fast reflexes made his bite meaningful. Horses can fool you in a similar fashion. Almost every hostile horse I’ve met is scared. True herd leaders are rarely combative, but instead, gain a following because of their calm and quiet confidence. 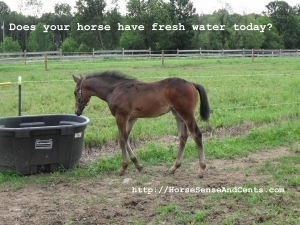 It’s always interesting to watch horses adjust to new situations. Leah’s always been pretty fearless (her mom breeds this through) but has also had a life that’s given her no reason to be afraid. It’s easy to expect a young and inexperienced filly to be reactive. I guess Leah figured I’d never put her in harm’s way before, so there was no need to worry. Plus, she hasn’t been one to form strong peer attachments. She likes company, but doesn’t seem to care much who it is. Dixie’s never been fearful, but she doesn’t have Leah’s confidence. She develops extremely strong peer bonds. Apparently, the farm provided a continuity she never had previously. Ripping her from that predictable comfort created a lot of angst. In hindsight, it would have been better to either introduce Dixie to one of her new pasture mates at Halcyon Acres® or figured out a way to keep her with Leah. Horses will surprise you. Sometimes retrospect provides great vision on equine reactions, but even when you’re keen about paying attention, you don’t see it coming. It’s curious that Dixie’s behavior was described as bad and Leah’s good. Dixie is a kinder horse. Leah’s had an easier life. Of course, that doesn’t explain the dogs. Remi’s lived the Life of Riley. Gatsby’s suffered abuse and scavenged loose on city streets so long his skin to have grown over the collar on his neck. Genetics can be a wild card with mutts (and unregistered horses). Still, knowing how to interpret what your horse is trying to tell you – and not making assumptions based solely on behavior, can help both you and your horse understand and adjust. Before you blame a horse for causing trouble, ask yourself what they might be thinking. I’ve been getting a lot of requests lately from people or companies seeking a guest post spot on this blog. I’m always happy to consider topics that would interest readers presented in an intelligible fashion. So, if you’d like if you have something useful to share, please don’t hesitate to contact me. Sadly, so many of these requests come in from some remote subordinate who knows nothing about the topic they’re pitching. That doesn’t bode well. This one caught my eye though, particularly given the large percentage of UK subscribers and book purchasers. The post below is provided on behalf of Vale Stables, which manufactures and supplies equine buildings. They’re based in Warwickshire but supply throughout the UK, Channel Islands and Europe. Which Type of Livery Do I Need For My Horse? 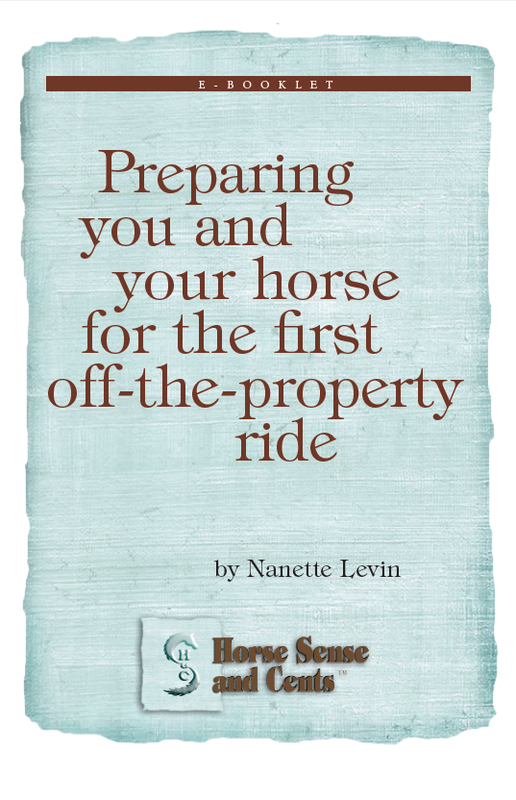 Owning your own horse can be very rewarding but it also comes with its own set of responsibilities. These include important criteria such as stabling, feeding and exercising. Often choosing a livery isn’t as simple as finding the nearest one. Instead there are many other factors that you might need to take into consideration. Here are the different types of livery stabling available and the advantages and disadvantages of each to help you decide the best option for you. Full livery is the equivalent of a five-star service. For a weekly or monthly fee, prices usually include all hay and bedding, mucking out, feeding, grazing, tack cleaning, box rental and exercise. Many have excellent riding country in close vicinity and some have cross country riding and hacking trails on their land. They generally have a good network of vets, dentists and farriers on hand should your horse need their services. All staff involved in the care of your horse are generally highly qualified. Advantages – Full livery offers a hassle-free service that gives the owner peace of mind. It’s an ideal stabling solution if you don’t have much time and simply want to enjoy your horse as and when you can. Disadvantages – Because of the services on offer, this kind of five star service doesn’t come cheap. Prices can start from around £150.00 per week and are often well in excess of this, depending upon where you go. Another alternative to a full livery service is part livery. With this option the horse enjoys all of the benefits that a full livery service brings such as food provisions, bedding, mucking out, box rental and grazing, but this doesn’t include exercise. Advantages – The main advantage of this option is the price. Often part livery can be around one third cheaper than full livery and is more hands on. Disadvantages – Clearly you have to be available to exercise your horse, so you’ll need to make sure that you have the time to do so. Do It Yourself, or DIY livery stabling, is often the most popular kind of stabling. A field or paddock and stabling are normally provided in the rental price, but the difference is that the owner undertakes all of the horse’s needs. Often DIY liveries will include other services as an add-on such as mucking out or hay provision, but this isn’t included in the price. Advantages – A DIY livery offers a more affordable way to look after your horse and is good for those that have the time and want to learn or undertake all aspects of horse care management. Disadvantages – Your horse will require a visit at least twice a day. This may limit the distance you want to travel and therefore your stabling options, whereas distance from your home may not be quite so influential when looking at full or even part livery. This is a form of DIY livery in which a field or paddock is provided and sometimes a field shelter, but there is no stabling. The arrangement is similar to the horse owner renting a field or paddock except they aren’t responsible for the upkeep of fencing and other facilities. Fees are also often charged per horse and not by the size of the field or paddock. Advantages – In terms of cost it’s a much cheaper option and for those who have the time it can be a good arrangement. Disadvantages – This is often only a viable option during the grass growing season and when the weather is milder. At other times the horses will need to be stabled elsewhere. Another option you may want to consider is a working livery. This form of stabling is particularly common around riding schools and means that the horse owner pays the riding school a discounted livery fee in return for the use of the horse for riding lessons. Disadvantages – If you’re particular about others riding your horse, then clearly this isn’t a good option. You may have to travel some distance to find a riding school that suits your needs. Finding the right livery for your needs and requirements isn’t always easy but by doing your homework and checking out your options, you’re likely to come to an arrangement that suits all parties. Vale Stables specializes in luxury stables and shelters in various sizes and designs. Find out more information online at http://www.valestables.com.